...man is not truly one, but truly two. , R.L. 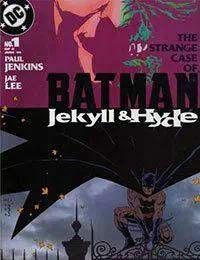 Stevenson, The Strange Case of Dr. Jekyll and Mr. Hyde Never has that been better demonstrated than in Batmans conflicted foe Two- Face, the subject of the new 6-issue miniseries BATMAN: JEKYLL &amp; HYDE by writer Paul Jenkins (Peter Parker: Spider-Man)! Expressing the dual nature of the villain, the miniseries will feature visuals by two distinct artists: Jae Lee (Inhumans) illustrates issues #1-3, while Sean Phillips (SLEEPER) draws issues #4-6! JEKYLL &amp; HYDE is a story of duality that examines how one man can seemingly harbor two souls, each bent on the others destruction. But who is more honest: the man who acknowledges his dark side or the man who suppresses it? Dont miss this terrifying tale of Two-Faces past and present, as he battles with himself, and the Batman!